Finally, my show this weekend is over. I ended up doing pretty well, but I'm tired and way behind on so many things. This is the primary item on my to-do list...posting what my partner, Amanda Tibbetts, sent me. FYI, her blog is http://www.amandamade.com/blog. She sent me a lovely collection, including nuggets and chips of lapis lazuli--what a deep, rich, beautiful blue! 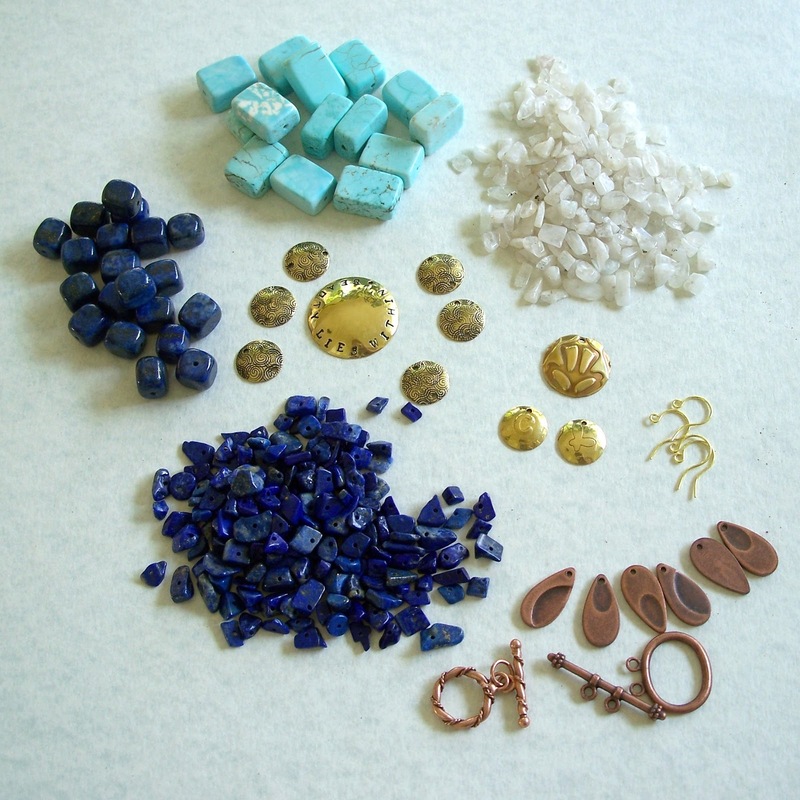 She also sent gorgeous, iridescent moonstone and the prettiest aqua magnesite. All my favorite colors! Amanda also sent a couple of copper toggle clasps and some very intriguing copper teardrops...can't wait to come up with something good for those! The very best part I saved for last. Amanda took some extra time to hand make brass charms. The focal is is a pretty round dome stamped with BEAUTY LIES WITHIN. She stamped 6 smaller disks with a scrolled pattern and has punched them for use as links. And the surprises keep coming! She also stamped a smaller brass round dome and two little domes that I may use as earrings since she sent some nice earwires. One is stamped with a butterfly and the other with my initial, C.
It is clear Amanda put a lot of thought into her contribution and I can't wait to get started. I am so glad you love it! I really enjoyed making the brass findings for you. Enjoy them! I've finished two projects using Amanda's bead soup and am pleased with how they turned out. Can't wait until the reveal!